The first section of the settings screen is the Cart Page Options section. The Background Color field affects the look of all catalog page backgrounds. This setting uses HTML hexadecimal color values as well as standard color names such as blue, black, white, etc.. If you are using background wallpaper, the color field will be ignored. The Logo Alignment field allows you to select either left alignment or center alignment. NOTE: If you are using a custom HTML header, your company logo will be automatically replaced with the header. Of course, it is a good idea to include your company logo in a custom HTML header. The Page Alignment field allows you to select either left alignment or center alignment for your registry pages. This means that the page content will be either aligned to the far left of the browser window or aligned in the center of the browser window. If you wish to display a custom HTML header, check the "Show Custom Header" checkbox and enter the full URL (beginning with http://) into the "Header URL" field. Using a custom HTML header is a good idea because you can include CSS (Cascading Style Sheet) Styles in that header which will allow you to customize the look of virtually every element on the page including text fonts, colors, & sizes, input field colors, titles, and so forth. For more information about CSS, see the code generator section of the ecommerce Administrator. If you choose to display a custom header at the top of your shopping cart pages, enter the full URL (starting with http://) into this field. Similarly, if you wish to display a custom HTML footer, check the "Show Custom Footer" checkbox and enter the full URL (beginning with http://) in the the "Footer URL" field. If you choose to display a custom footer at the bottom of your shopping cart pages, enter the full URL (starting with http://) into this field. The Page Width field allows you to define the width of the content section of your site's catalog pages. 750 is a good starting point, but you may make your catalog pages whatever width you like. If you choose to have a background wallpaper, your page content will be surrounded by the wallpaper. If you choose to align the page content to the left, then the wallpaper will be displayed to the right and below the page content. If you wish to display a small image (called a thumbnail) of a product when it is added to the cart, check this checkbox. If you decide to show the product thumbnail when an item is added to the cart (see "Show Product Thumbnail" above), you may specify how big the image will be by entering a number of pixels for the height. The width will be proportional to the height. 50 pixels is a good number to start with. By default, when a shopper adds an item to the cart and clicks the "Continue Shopping" button, they are taken to the catalog home page (the main page of the catalog which displas the top-level categories). If you want the shopper to go somewhere else when they click this button, enter the ful URL starting with "http://" into this field. The second section of the settings screen is the Commerce Settings section. Select your home state from the dropdown list. Then, enter your sales tax percent into the next field. Using this editor, you can setup sales tax charge percentages for all 50 States as well as all Canadian Provinces. 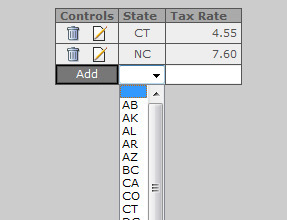 Just click the "State" drop-down list to select which state you wish to add to your multi-state sales tax list. Then, enter the sales tax percentage for that state. For example, if the sales tax percentage for a state is 6 3/4 percent, enter that as 6.75. Do not enter a percent sign (%). Then click the "Add" button. You may also edit or delete a state's sales tax percentage setting. In some states, such as Florida, retailers must charge sales tax on shipping charges. If you need to charge sales tax on shipping charges, check this checkbox. In order to send a confirmation email when a customer makes a purchase, you must enter a valid return address into this field. If this field is left blank or the email address is invalid, the confirmation email will not be sent. 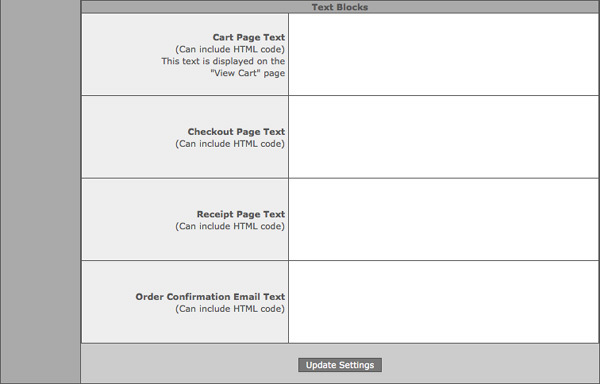 If you want the cart system to send you an email when a customer makes a purchase, check this checkbox. I you want to offer your customers gift wrapping options (and setup charges for them), check this checkbox. Then, click the Gift Wrap Options icon in the left menu to setup your gift wrap options and charges. On the checkout page where the customer enters their name and address information, there is an email address field. If you want this field to be a required field on this page, check this checkbox. On the checkout page where the customer enters their name and address information, you can optionally include a phone number field. If you want the phone number field included on the checkout page, check this checkbox. If you want the phone number field to be a required field on the checkout page, check this checkbox. On the checkout page, you can optionally include a comments field. This is handy for your customers to enter any additional shipping instructions or other information that they may wish to tell you about their order. If you sell to tax-exempt customers, you may optionally include a Tax ID field. You can optionally include a field on the checkout form to gather information about how your customers found your site. If you would like to include this field on your checkout page, check this checkbox. You can optionally include a checkbox on the checkout page to allow your customers to add their email address to your mailing list. These email addresses are maintained in the Mailing List Manager (included free with CommerceSuite). If you want to include this field on your checkout page, check this checkbox. If you want to set a minimum amount for customer orders, you can enter the amount in this field. For example, if you want to set a minimm order size of $25.00, simply enter 25.00 into this field. Do not use a dollar sign ($). By default, the Add to Cart buttons on your catalog prodcut pages will be labeled "Add to Cart". But, if you would like to use something else such as "Add to Bag", change the text in this field. CommerceSuite supports a variety of credit card processors. Most require a credit card merchant account. If, you do not have a credit card merchant account, you can still use PayPal as your credit card processor and no merchant account is required. The first thing to do is select your payment gateway by dropping down the list marked "Payment Gateway" and clicking on your chosen gateway. Next, fill in the required information for your gateway. In the case of AuthorizeNet, you will see a block marked "AuthorizeNet Merchant ID. 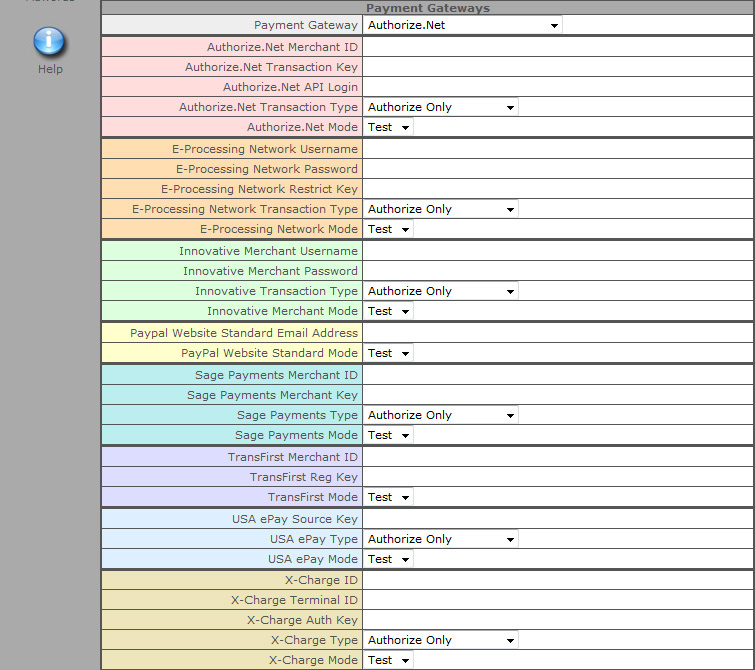 This field is only for clients using an older version of AuthorizeNet's system. Most merchants will leave this field blank. Do fill in the Transaction ID and the API Login fields. Be sure that you get the correct information in the fields - reversing them will cause an error when you try to authorize a card. NOTE: While in test mode, the "Mode" field is locked into Test. Once you "go live" with CommerceSuite, you can change this to "Live" or back to "Test" at any time. Once you have typed your credit card processor account information into the correct fields on the settings page, click "Update Settings" at the bottom of the page. At the bottom of the settings page there are four text blocks. Each block of text appears on a different page in the checkout process. You may include your own text on these pages. These text blocks will also accept HTML code so you can make some text bold, italic, different colors and sizes and so forth. Including an image tag similar to this in your custom text block will allow you to include any images you want.